Chelsea Manning has allegedly been in solitary confinement since she was sent back to prison on March 8, and her supporters are calling for her to be moved. 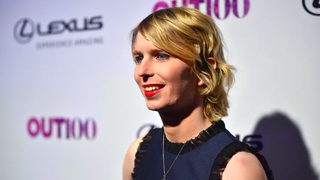 “We condemn the solitary confinement that Chelsea Manning has been subjected to during her incarceration at William G Truesdale adult detention center,” the group Chelsea Resists! wrote in a statement. “Chelsea can’t be out of her cell while any other prisoners are out, so she cannot talk to other people, or visit the law library, and has no access to books or reading material. She has not been outside for 16 days. She is permitted to make phone calls and move about outside her cell between 1 and 3 a.m.
Manning was found in contempt after refusing to testify about the classified U.S. documents she sent to WikiLeaks in 2010 when she was a Army intelligence analyst. She said she objected to the secret nature of the grand jury process, and that she had already revealed everything she knew.